I've been on kind of a Chromebook kick lately and I must say I love this Acer C720 even more than Samsung Chromebook. Why you ask? Well - the primary reason is the processor architecture. The Acer C720 is a traditional x86 processor, meaning you are able to easily boot alternative OSes on it. This also means that under a Linux OS I am able to run applications like the latest Google Chrome browser, Google Hangouts (or Skype), Steam, and even Netflix. I plan on writing a formal review of the C720, similar to the one I did for the Samsung Chromebook, later next month. 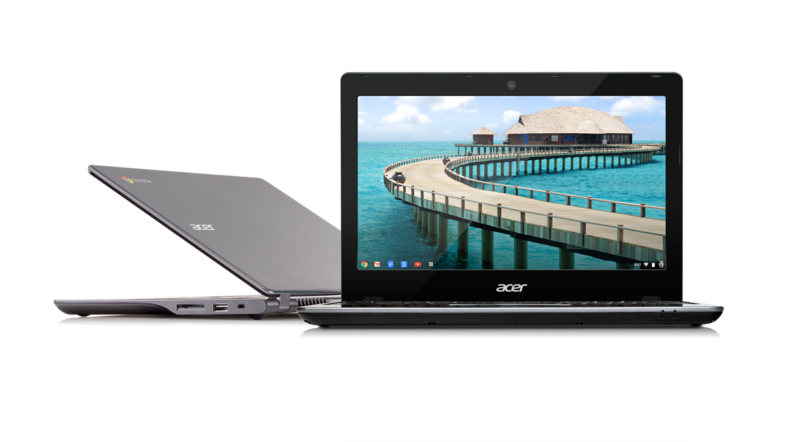 Today however I would like to share how you can go about installing Bodhi Linux on the Acer C720 Chromebook. Please note following these steps WILL permanently delete all local data and configurations of your ChromeOS! Make sure your chromebook is off. Then hold the escape and refresh keys (where f3 should be) and power on the device. This should get you to a recovery screen - press ctrl+d followed by enter. The system should now reboot with developer mode enabled. After changing to developer mode, configure Chrome OS so that you can log in. Open a crosh window with Ctrl+Alt+T. Open a bash shell with the shell command. While the C720 uses an x86 processor, some of the hardware it uses doesn't have drivers in the mainline Linux kernel yet. Because of this you need to download a custom ISO image I've prepared for the C720 from here. You then need to write it to a flash drive using the dd command. Where X is replaced with the drive letter of your USB stick. If you prefer a GUI tool or are using OSX/Windows to create the flash drive you can find detailed information on this process here. Plug the USB stick you prepared in step 3 into your Chromebook. At the startup screen press the key combination ctrl+l (that is a lowercase "L") to tell the system to boot from the legacy BIOS. Then press the escape key to select to bring up the boot menu, select your USB device from the list it provides. From this point you can follow the normal Bodhi install instructions starting with step II. When your Chromebook starts up you will need to press ctrl+l to boot into the legacy BIOS/Bodhi. Still looking for a work around to remove this step - if you know of one please let me know! When I installed Bodhi on my Chromebook I wiped out all the Chrome partitions and gave Bodhi the full drive. I've not experimented with a dual boot setup. I don't really have a need for ChromeOS with how functional Bodhi is on this hardware. The custom ISO image for the C720 differs from the normal Bodhi desktop release in a few ways. First is that it utilizes the 3.11 Linux kernel with a few custom patches to support the C720 hardware. Second is that it utilizes pulseaudio for the default sound system as alsa has a few issues. It has slightly newer Intel/Mesa drivers to support OpenGLES on the C720 by default. Finally, it comes with a custom E profile that has key bindings for Chrome OS function keys configured. Finally, if you have any issues getting Bodhi setup/installed on your Chromebook I would ask that you please open a support request on our user forums as opposed to simply pasting a comment below. Will this work on the Acer C710-2847 Chromebook or just on this model? I haven't tested on that hardware, but try booting the Live USB to see. It should, that model has an x86 processor as well. Netflix works in ChromeOS, as does Hulu and Hangouts. You don't need full blown Linux to use those services. But I can see the usefullness of having Ubuntu for Skype or Steam. I never said these things didn't work under ChromeOS. My intention was high lighting things to do NOT work under a Linux OS on ARM Chromebooks. Just bought a new C720, will try this out, thank you! When I enter legacy mode and select my USB device it tells me missing operating system. I used UNetbootin to create the usb drive from your ISO. Any ideas what could be wrong? You need to create the flash drive using the dd command as I specified in the post above. I'm not sure what this BIOS does differently from other traditional BIOSes, but Unetbootin created drives do not boot on it. Thanks I got it working! I'm loving how minimal this version is. Hey Kevin, would you mind telling what you did to resolve the issue? I currently have the same problem and I can't seem to find an answer. I've formated my USB drive to Ext4, and followed the "dd" command, still nothing. Thanks! Unetbootin will work. I used it and was able to install. I did have the missing OS issue once but narrowed it down to the USB stick I was using. I used a different one and it worked fine. Make sure you do not have anything else on the stick too. Thanks! Works like a charm, never tried Bodhi before (Xubuntu here), but I love it. Yep. We mention that in our wiki. Do VMs run well on the C720? Haven't had a chance to play with that myself yet. I am currently running a VM from pentesterlab.com (Debian), no problems at all. Anyway to disable the power button instantly shutting down? I tried removing the keybindings in the acpi bindings manager but it didn't seem to help. Based on this post it looks like you need to edit the powerbtn.sh in /etc/acpi directory. I just purchased a c720 today and have very little Linux experience. I wanted a low cost laptop to run an Ubuntu LAMP Server. It sounds like the Bodhi distro may be a better option for this laptop. Can I load AMP on Bodhi and run as a webserver? Bodhi will do anything Ubuntu does that isn't unity specific. Perfect. I have the stock 16GB SSD. I assume that is enough for this install? Yep, it needs at least 3GB to be happy - 16GB is plenty. Thanks for a good write up. The install was easy. I'm still playing with key bindings, Toggling from desktop to command line. One thing I might mention is the time it would take for the computer to get from one command to the next step was often longer than expected. Patience works here. Can you describe how to remove Bodhi and return to stock? Is it possible to dual boot? I'd like to have Chrome remain on the SSD and run Linux on a USB drive. Sure. Just select the USB/SD card you want to boot from as the install target when you walk through the Bodhi installer. Is the custom image for all 720 models or is there a specific sub model number it was designed for i.e. 720-2848 etc etc? Should work on any C720 model. I can't play sound whith the internal speakers. Can anyone please explain me how to do it? Audio is enabled by default - just make sure your speakers aren't muted. Press the unmute button or click on the speaker icon in the upper right hand corner of the screen to make sure it is unmuted. If that doesn't do the trick please open a thread on our support forums. Works like a charm up until the auto partitioning during the installation. Then I get an error message about the being unable to inform the kernel of changes made. I would prefer to wipe the SSD and just boot Bodhi but I've also tried installing to an SD card and got the same results. Any suggestions? Thanks for the work developing the hardware in this direction. Please open a support request on our forums with a screenshot of the error and details on what you did to get it. I've done a couple dozen installs at this point and haven't hit what you are taking about when I wipe out the entire drive and give it to Bodhi. The only modification I added was "sudo" in front of the "Copy the image to the USB stick" command. Regardless, I appreciate all your hard work and the team dedication to this project. Best wishes! Thanks for sharing Jef. I found that touchscreen did not work out of the box on C720P-2600 after booting your image into RAM. Any suggestions or plans to add this ability to future images? Also, I got an Elightenment Error. This is very bad. Enlightment SEGV'd message. Removing ~/.e directory would fix that? Just tap F1 to restart E, no need to wipe anything out. I don't own a touch screen model so I can't test changes. I'm going to try and build these modules into my 3.0.0 Chromebook image, but I won't be able to test them myself - so no promises they will work. I'll receive my C720p in a few days, can't wait to try your distro. Do you still plan on including the touchscreen drivers on 3.0.0? I attempted to include them in the beta. If they don't work there really isn't much more I can do since I can't test things myself. Does it work bodhi-c720-chromebook.iso with C710 ? Great stuff. Did you try this to avoid using ctrl+l to boot into the legacy BIOS/Bodhi? Pretty sure this requires hardware access to flash a different BIOS. Not a good solution. I just tried bodhi on my c720, love it! Buuut, sound quit after 1st suspend, wtf! Spent a day researching experimenting etc. Some how, the default out put went hdmi. In my case some thing set it to hdmi, hmph. Just click built in analog stereo. to enable playing various content. That is due to a small bug with how the automatic audio output works over HDMI. Run your system updates and it won't happen any more. Is the C720 64 bit? Do you have a customized 64 bit distro? There is zero reason to run a 64bit OS on hardware with the specs of a Chromebook. Yeah there is. I'm using the Chromebook to run Pianoteq, which has low ram requirements but is fairly processor intensive. Benchmarks show better performance with 64 bit, which means more polyphony for me. I have no intentions of making a 64bit Chromebook disc. If you are doing anything processor intensive a Chromebook isn't the ideal device for that task. Excellent write-up. Had some problems with Bodhi creating and formatting the partition with encryption enabled. Retried a few times without encryption and it worked like charm on Acer C720 w/ 16 gb. Did anyone tested Bodhi image for the C720 on toshiba 13 chromebook? I just bought one and willing to try, but I don't want to screw anything up. Hardware on acer and toshiba is very similar. Not that I'm aware of. This is a live CD though - so give it a try. So there's about 13 GB free after Bodhi installs for user on a 16 GB SSD? Hi Jeff, I did the install awhile back and to boot was doing the ctl-l. By accident I hit enter instead and it now is back to the "chrome os is missing or damaged" screen. I have also gotten to the "os verification is off" screen with resets and ctl-d...but I have been unable together back to booting up and having the ctl-l option to boot into bodhi. Any tips would be great. Thx. You need to restore ChromeOS and then restore USB booting from it. Actually it can't on the Bodhi image. The kernel version is locked via apt-get. Is there a way to upgrade the kernel? Heard there were newer drivers for Haswell chipset since it's fairly new. You can change the kernel the same way you would on any linux os. Just be aware the trackpad takes special drivers to be functional - if you change kernels you will need to track these down yourself. Enjoying this on my C720 with the MATE desktop installed--so far Bodhi Linux has been the perfect subsection that offers the best support of a Ubuntu based, Chromebook hardware configured OOTB, MATE desktop capable with full Compiz\Emerald distro for me. And I've tried quite a few installs at this point. I can't thank you enough for that. That having been said, I'm running into an issue with the Function keys and Cheese. I enabled Cheese fullscreen and have been unable to restore it to a minimized form because the F11 key is mapped differently...is there a way around this? Chromebook hardware only has f1-f10 keys. I have a strange problem. I followed the install procedure in the blog and everything went smooth. I had the sound problem with PulseAudio and I managed to make it work by downloading PulseAudio Control and setting the sound to Built-in Analog stereo. Everything is working ok. The problem I have for couple of days is that my headphones are not working any more. Sound is ok through the speakers, but when I plug in headphones and sound disappears. I know is not the headphones, beacause I know they work on my other machine. Any ideas? Or please refer me to a forum where I can get help. Thanks in advance. Head over to our user forums. Live cd image does not support trackpad at all on my toshiba chromebook. Is there any fix? Don't own this hardware so I can't speak to it. Whatever you do to make the trackpad work on other Linux distros should work with Bodhi as well. Grabbed a C720 from Best Try using the trade-in deal. Farted around with Chrome for a couple of days. Kinda useless offline, but that's the nature of the design. I followed the instructions, loading the Bodhi Chromebook image from a stick; I can report no problems and have no complaints. It's now is a useful little laptop with access to the extensive Bodhi and Ubuntu repos. Very good, very nice. So nice, I used the same image to resurrect an old D410 I had languishing. Now it too is a happy camper. Great job Mr. Hoogland. Thanks! Me again, with an update. I had the unfortunate experience of losing my installation due to battery discharge. Darn thing has such a good battery life I just plain forgot!! Quite a few threads on the 'net on the subject - including one calling the lack of a system battery a "design flaw". I made the mistake of allowing my BodhiBook to languish long enough to kill the internal battery and will now have to do a reload - I removed ChromeOS completely, but at least I followed the instructions for making a recovery stick. I think I'm going to wait for the 3.0 iso and this time do a remastersys (or something) just in case. Darn thing has such good battery life I just plain forgot!! Can I install Bodhi with Crouton? Tried to post in the forums but it's not letting the post go through. There is a post on our forums about this here. Thanks for putting this together, Jeff Hoogland. I installed this last night after a week with Chrubuntu. Man, it's been years since I worked with Enlightenment. My install is hanging on the "Preparing to install Bodhi" screen. Am I doing something wrong? If you are having an issue please open a support request on our user forums. If I wipe out all the chrome partitions and install Bodhi on the whole SSD, can I regardless reinstall Chrome at any time? I just wanted to know if you will prepare an iso for the c720 with Bodhi 3? There was a Chromebook ISO image posted with Bodhi 3 for both our beta and RC1 releases. Can anyone comment on the battery life on the c720 with Bodhi 2.4?? 6~ hours give or take how hard you are hammering the processor. hey, i cant get the cd command to work, could you please help with that? Please open a support request on our user forums if you are having trouble getting things installed. Is there a workaround yet for having to push ctrl + l every startup? Only one that involves opening the hardware up and changing jumpers around. Now that I installed your Bodhi on my C720, I want to take out the stock 16G SSD and put in the new 256G SSD. I need to know how to copy everything from the 16G to the 256G? Is there a way to make a bootable USB that will put everything on to the 256G SSD when I boot after installing the new 256G SSD? In terminal you can use sudo remastersys-gtk to launch a GUI backup tool. Hey Jeff, awesome writeup. Didn't even know about Bodhi until I tried this, and now I'm loving it and putting it on all my machines. :) Can you give me a quick pointer about what you did to get the trackpad working on the c720? Just compiled the extra kernel modules like you would do on any Linux OS. Anyone try an ASUS C200 or C300 yet? Hi Jeff, guys, and apologies if off-topic but ... can anyone who has experience of c720 hardware tell me - should I expect a working motherboard to output to HDMI when there is no screen or NGFF installed. Just bought a basket case; was planning to use google recovery image to load to a USB2 drive to get me to the stage I can load bodhi but I get no response to HDMI screen - though it does light the second blue light when I press the power button and will then "check" a USB CD Rom with the iso - but not load. It should always output to the HDMI I believe. Hey Jeff, I would like to install Bodhi on an Acer CB3-111. Should I go with your C720-distro or should I take the regular Bodhi? I'd give the c720 image a try first. Crouton is a Chroot root. It is like putting your Linux OS inside a jail inside Chrome OS. The Bodhi disc installs fully onto the bare hardware. Hmm I'm not sure what the ramificationis of that are, but jail doesn't sound good. I guess a more direct question is how much ram does bodhi use? And if I use chrome browser will that add the same amount of ram usage chrome uses on my windows? Chrome should use the same RAM regardless of platform. The desktop Bodhi uses is designed to be light weight. It uses about 100MB. please help me to get my audio back on my c720! I could not get this to work on C-720. WOrking on it for hours and hours (days really). Please open a support request on our user forums. what user forums? The link you put in is Sorry, the page you were looking for in this blog does not exist.. What other forum is there than the one following this article? I see a million comments with some helpful replies but have no idea how to do anything other than what I did which is to post here.